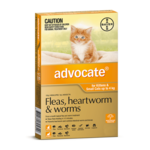 Advocate is a monthly cat flea and worming treatment product from Bayer that offers superior protection for your cat against fleas, ear mites, intestinal worms, lungworm, and heartworm. It comes in a sleek gold and yellow packet, with yellow packaging for small cats and kittens and purple packaging for large cats. 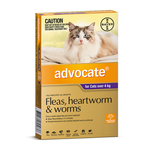 Advocate can also be used for ferret flea and worming, as advised by your vet. How to use Advocate: Advocate is applied to your cat topically, as it comes in a spot on tube that allows the liquid to be applied to the back of the neck. This is very convenient for cat owners, as nobody enjoys giving tablets to their cat! A pill-free flea treatment allows you to treat your cat without getting bitten. While there is no cat vaccine for fleas, worms or heartworm, Advocate is as close as you'll find to a vaccination against parasites. How long does Advocate take to work? Advantage is rapid onset, and stops fleas biting within three to five minutes after applying. It then kills adult fleas within twenty minutes after application. How long does Advocate last? Is Advocate safe for cats? Yes, Advocate is safe for cats. It is available for large cats or small cats and kittens, and when dosed appropriately it is completely safe. The active compound is imidacloprid g/L and moxidectin 10g/L, which has been used safely in cats, and has been recommended by vets, for years.